SPANISH national and regional authorities are joining forces to demolish the controversial Hotel Algarrobico. The government’s Minister for the Environment, Isabel Garcia Tejerina, and Andalucian Junta minister Jose Fiscal are thrashing out a plan to flatten the Cabo de Gata beachside complex. A 2012 report put the cost of restoring the land near Carboneras at €7,175,000. 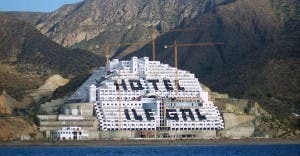 Last week, Spain’s Supreme Court ruled that the hotel was built on protected land and belonged to the Andalucian Junta. “This allows us to start demolishing it,” said Garcia Tejerina. A date has not yet been set for the proposed demolition. The president of the Andalucian court, Lorenzo del Rio said the decade-long court battle was ‘definitively resolved’ from a judicial perspective. Junta head Susana Diaz welcomed last week’s court’s decision, saying ‘at last justice has been done’. In many ways it is very sad that so much money has been spent in building the hotel and now there is the further cost of demolition and the rienstatement of the land. Clearly there are some fundamental weaknesses in the Spainish planning processes that urgently need to be addressed so the current situation is avoided in the future. The original planning consent was clearly incorrect and it is difficult to understand why the restrictions on building so close to a beach were ignored both locally and in Almeria. Michael, this has been the story of the Junta de Andalucia’s life, demolitions are their ‘thing’, they like it. They have proved time and time again that they are incapable of running anything or getting anything right. The current planning laws are not fit for purpose and need to be changed as a matter of urgency. Why do you think so many people in the region have had their homes declared illegal and in some cases, demolished? PSOE have made a complete hash of running Andalucia for the past 30 years and it is no accident that it is the poorest and worst performing region in Spain on all levels. I hope PSOE do not form any part of the next national government because if they do, you can look forward to the whole of Spain being run as badly as Andalucia. A similar situation seems to be arising in the parcel of land next to Estepona Marina where even though it is coastal land there are still plans, which are supported by the Ayuntamiento, to build 3 eight storey apartment buildings plus penthouses and parking and also 4 areas of locales totaling in excess of 35,000 m2 right next to one of the most beautiful beaches on the Costa de Sol, Playa del Cristo. The environmental damage that could be caused would be irreversible and regretted by generations. The Junta does not have responsibility for local planning decisions. It’s with the municipalities. . Nothing would change if PP was running Andalucia. Maybe just, if it was Ciudadanos or Podemas. At the time this hotel was conceived and built, 20% (yews, 1 in5) of all Andalucian municipalities had the mayor and/or head/responsible for planning in jial or pending trial for corruption on planning issues. It was split between PP and PSOE controlled councils. And look at what’s happened in that PP stronghold, Valencia? and in Barcelona? The notorious ‘3%’ or more, the constructors were asked to give the polticians’ for elevated costs on public contacts paid for by… the public. 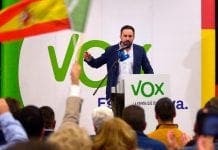 Corruption has been endemic in Spain for centuries and only now are people bcoming sick and tired of it, so they are starting to vote for the options.